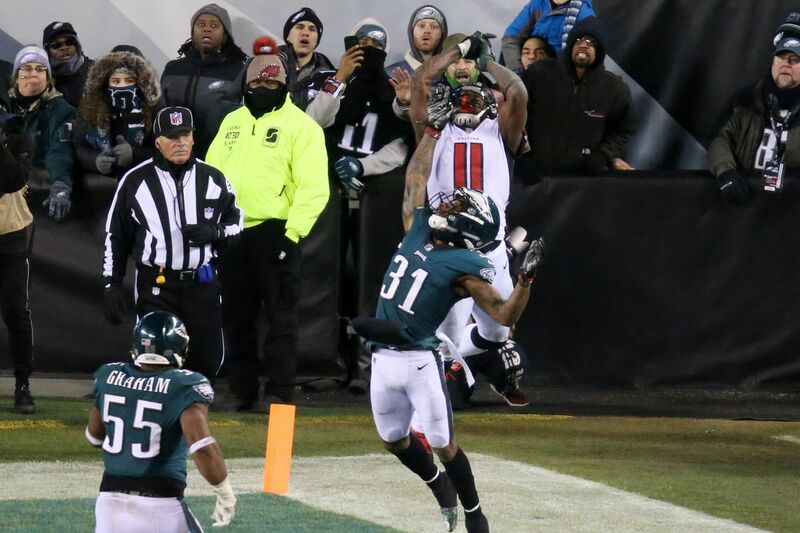 Falcons wide receiver Julio Jones (11) couldn’t catch a pass under pressure from Eagles cornerback Jalen Mills (31) late in the Eagles' playoff win against the Falcons at Lincoln Financial Field on Jan. 13. The Eagles will open the NFL season on Sept. 6 at home against the Atlanta Falcons, host the Minnesota Vikings in a rematch of the NFC championship game on Oct. 7, travel to London to play the Jacksonville Jaguars on Oct. 28, and play back-to-back road games against the Dallas Cowboys and Los Angeles Rams in December. Those are highlights of the Eagles' 2018 schedule, which was released on Thursday night. The Eagles play five primetime games, including the season opener and the Rams game on Dec. 16. They also have a Thursday night game at the New York Giants on Oct. 11, a Sunday night game at home against the Dallas Cowboys one month later, and a Monday Night Football matchup with the Washington Redskins at Lincoln Financial Field on Dec. 3. The Falcons game kicks off the entire NFL schedule, which is customary for the Super Bowl champions. The Eagles have three extra days to prepare for a Week 2 visit to Tampa Bay before returning home in Week 3 against the Indianapolis Colts, who are now coached by former Eagles offensive coordinator Frank Reich. They end September in Nashville against the Tennessee Titans. One of the most-anticipated matchups is against the Vikings, who were the second-best team in the NFC last season and added Kirk Cousins at quarterback. They also hired former Eagles quarterbacks coach John DeFilippo as their new offensive coordinator. The Eagles return four days later with a road trip up the Jersey Turnpike to face the Giants and the coach DeFilippo replaced, Pat Shurmur, who is now the Giants head coach. That's followed by extended rest before the Eagles welcome the Carolina Panthers and former starting receiver Torrey Smith. They close the first half of the season with the London trip. It's the Eagles' first time overseas since the NFL's London Games started in 2007. "I'm really excited about it," owner Jeffrey Lurie said last month. "London has become a hotbed for American football. Every game sells out instantaneously. It's an incredible city as we all know. I'm very much looking forward to it. First time we've had a chance to go over there. Nice to go over as Super Bowl champs. It's going to be a big game." The Eagles return from their bye week on Nov. 11 with a Sunday night game against Dallas. That precedes a tough road game against the New Orleans Saints in Week 11, presenting a matchup the Eagles avoided last postseason. If you enjoy NFC East rivalries, you'll savor the following three weeks. The Eagles host the Giants and Redskins on Nov. 25 and Dec. 3, then visit the Cowboys on Dec. 9. The Cowboys game is the frontend of a challenging two-game road trip capped by a Dec. 16 visit to the Los Angeles Rams, a burgeoning Super Bowl contender. It will be Carson Wentz's return to the site that his 2017 season ended prematurely with a torn anterior cruciate ligament. The Eagles close the season with a visit from the Houston Texans in Week 16 and a train down to play the Redskins to for a Dec. 30 season finale.